Diving is growing in popularity by the day, and there are a huge number of people already doing that- a whopping 5 million. For some, diving is recreational, for some it is work. Diving like flying is something that you get better at with experience. One of the big perils of diving is compression illness. This happens when one’s rise to the surface of the water is faster than mandated and the nitrogen dissolved in the diver’s blood stream forms bubbles because of the sudden difference in pressure. These bubbles cause the symptoms known as decompression illness or bends. The only way to cure a diver of these bends is by putting him in a decompression chamber, also known as a hyperbaric oxygen chamber. This is usually located at a medical facility, and is operated by trained doctors and nurses. If a diver follows standard operating procedures, there is no reason why that person should fear bends. If however one feels that one may have been a little lax, and probably ascended to the surface faster than one should, then perhaps one may worry about having been afflicted by bends, especially if one suffers from any of the many symptoms associated with them. Now these symptoms cover a really wide range, and may include breathing trouble, memory loss, headache, vomiting, joint pain, fatigue, rashes and so on and so forth, and one should immediately visit an emergency medical center and get oneself checked up. This is because a delay in starting decompression, especially in a severe case of bends can mean serious trouble. This may lead to permanent problems including slurred speech, short term memory loss and lack of energy; pretty much like the effects of a stroke. Bends is something that no diver wants to undergo, and many of them don’t get them treated, as they fear being stigmatized as irresponsible or inefficient divers. That is again a very wrong approach to take, because you may get bends even though you made all conscious efforts to follow the rules. You can time your ascent wrongly for instance. There is simply no call for ignoring symptoms, if one is a responsible diver. You have to go get yourself checked-up. In order for a diver to never ever get bends, he or she can try some proactive measures. For starters one should be trained well to undertake diving. Diving along with a buddy is a good thing to do as well. Lastly strictly adhere to dive tables, when it comes to ascent. If one is quite faithful in observing these precautions one may be able to avoid the pain and inconvenience of bends. Considering that diving is becoming increasingly popular around the world with about 5 million people having taken to it, it is important that there be sufficient awareness about bends. There should also be awareness about access to facilities to treat them, and what to do in case of an emergency. Rick Williams is a freelance writer who writes informative and helpful articles about compression illness that is caused while diving. 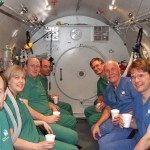 He has also written several articles reflecting the benefits of decompression chamber.